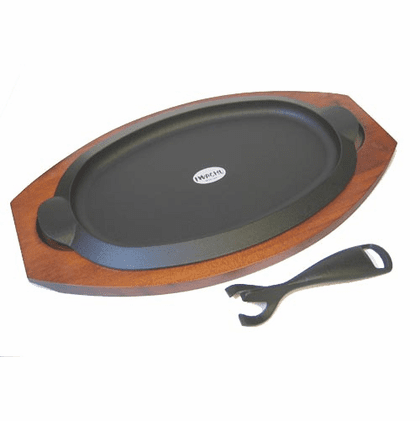 This Iwachu cast iron steak tray is 10-1/2 inches (27 centimeters) long, 6-1/2 inches (16 centimeters) wide. 4.7 lbs. First, use high heat and warm a small amount of oil in it. Remove from flame and wipe the oil out. Clean the pan with hot water and heat it to dry. Add a small amount of oil after it is dry. Spread the oil around it to form a thin film. Store in a dry place. Do not expose it to salt.